A-HOTEL.com - Luxury and cheap accommodation in Syrskiy, Russia. Prices and hotel, apartment booking in Syrskiy and surrounding. Located in Lipetsk, within 15 km of Nizhny Park and 15 km of Sobornaya Square, Hotel Valensiya features accommodation with free WiFi. The property is around 11 km from Regional Cultural Centre, 12 km from Zvyozdny Sports Complex and 14 km from Metallurg Stadium. Situated in Lipetsk, 10 km from Sobornaya Square, 11 km from Nizhny Park and 7 km from Regional Cultural Centre, Лофт offers accommodation with a balcony and free WiFi. This property is 8 km from Zvyozdny Sports Complex. 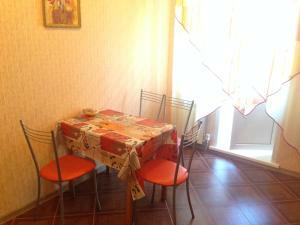 улица Кривенкова offers accommodation in Lipetsk, 10 km from Sobornaya Square. Complimentary WiFi is provided. Set in Lipetsk, 10 km from Sobornaya Square, Апартаменты на елецком шоссе. Features a living room with a flat-screen TV. Featuring accommodation with a balcony, Apartments on Mistuykova is situated in Lipetsk. The apartment, housed in a building dating from 2015, is 10 km from the Sobornaya Square. Apartment on Belana 7 offers accommodation in Lipetsk, 10 km from Sobornaya Square and 10 km from Nizhny Park. Guests staying at this apartment have access to a balcony. Apartment on Belana 11 is an accommodation located in Lipetsk, 9 km from Sobornaya Square and 9 km from Nizhny Park. The property was built in 2010 and features accommodation with a balcony. Featuring city views, Apartment on A.G.
Апартаменты на Стаханова 59 in Lipetsk offers accommodation with free WiFi, 8 km from Sobornaya Square, 8 km from Nizhny Park and 7 km from Regional Cultural Centre. Guests staying at this apartment have access to a fully equipped kitchen. Апартаменты "На Белянского 12" is located in Lipetsk. The apartment, set in a building dating from 2012, is 10 km from Sobornaya Square and 11 km from Nizhny Park. Room on Khoroshavina is located in Lipetsk, 9 km from Sobornaya Square, 9 km from Nizhny Park, and 6 km from Regional Cultural Centre. The property is 7 km from Zvyozdny Sports Complex and 8 km from Metallurg Stadium. Set in Lipetsk, Апартаменты на Стаханова provides air-conditioned accommodation with a balcony and free WiFi. This apartment is 8 km from Sobornaya Square and 8 km from Nizhny Park. Apartments on Stakhanova 45 is an apartment located in Lipetsk, 6 km from Sobornaya Square. The apartment is 6 km from Nizhny Park. Located in Lipetsk, Apartments on Behteeva 4 features free WiFi and units equipped with a kitchen and balcony All units come with a seating area, a flat-screen TV with satellite channels and a private bathroom with free toiletries and bath. An oven and kettle are also offered. Situated in Lipetsk within 8 km of Sobornaya Square and 8 km of Nizhny Park, Hotel Na Bunina offers rooms with free WiFi. The property is around 5 km from Regional Cultural Centre, 7 km from Metallurg Stadium and 7 km from Zvyozdny Sports Complex. Located in Korovino in the Lipetsk region, Apartment on Teperika features a balcony. Guests staying at this apartment have access to a fully equipped kitchen. Located 8 km from Sobornaya Square in Lipetsk, Apartment on Merkulova 30 offers accommodation with a kitchenette. The Nizhny Park is within 8 km of the apartment. Apartment on Katukova 18 in Lipetsk features accommodation with free WiFi, 7 km from Sobornaya Square and 7 km from Nizhny Park. Guests staying at this apartment have access to a balcony.